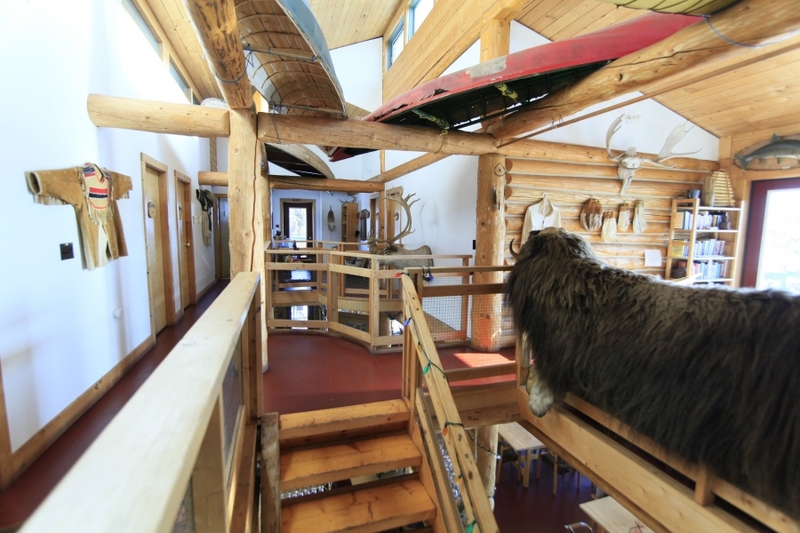 There are no roads to Blachford Lodge which is located 20 minutes by ski plane from the city of Yellowknife in Canada’s North West Territories. 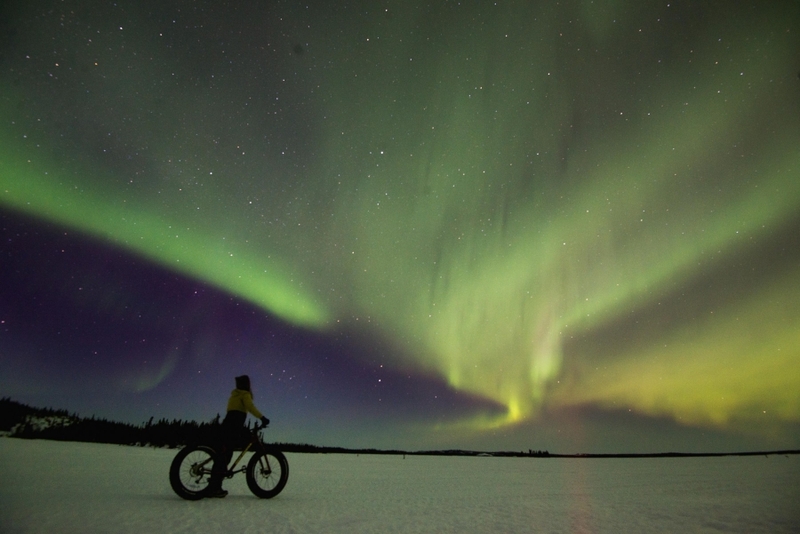 Often cited as one of the best places to view the Northern Lights for its clear skies, Yellowknife has a feeling of exclusivity and remoteness like no other place we know of. Visited by the Royal Duke and Duchess of Cambridge William and Kate during their honeymoon in 2011, Blachford Lodge has the perfect mix of wilderness and luxury. 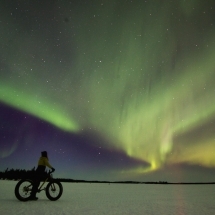 This three night trip next to the Great Slave Lake offers the chance to search for the Aurora and choose from a range of day and evening winter activities. Perfect for honeymooners, families and romantic getaways, please get in touch with us to customise your holiday. 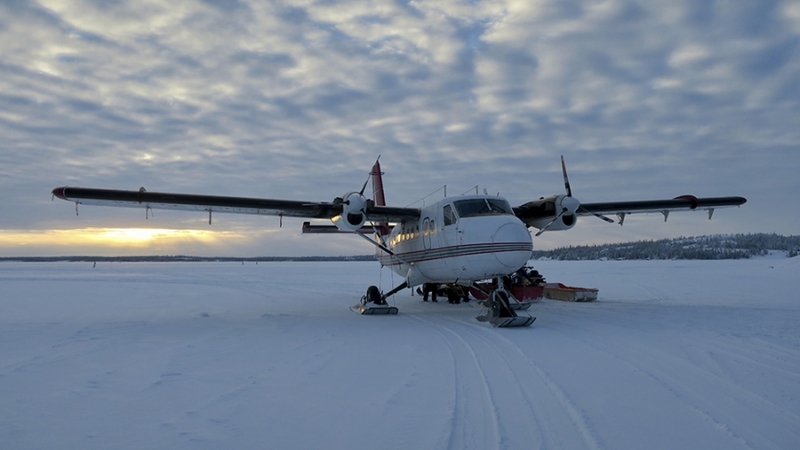 Arrival to Yellowknife to pick up the charter ski-plane to Blachford Lodge. 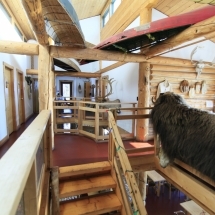 Settle into your room either in the main lodge itself or in one of the cosy rustic cabins dotted about on the site next to the frozen Great Slave Lake. All meals are included and the menu features a plethora of local northern ingredients including fish, meat and home-grown vegetables. The in-house chef is a passionate cook and keen to share the delights of the surroundings with guests and diners. Everyone loves “Tire sur la neige” – a delicious maple syrup served on fresh snow beside the lodge. 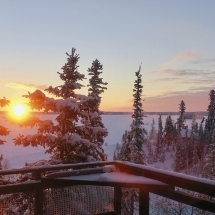 Blachford Lodge stands on a rocky outcrop overlooking the Great Slave Lake. 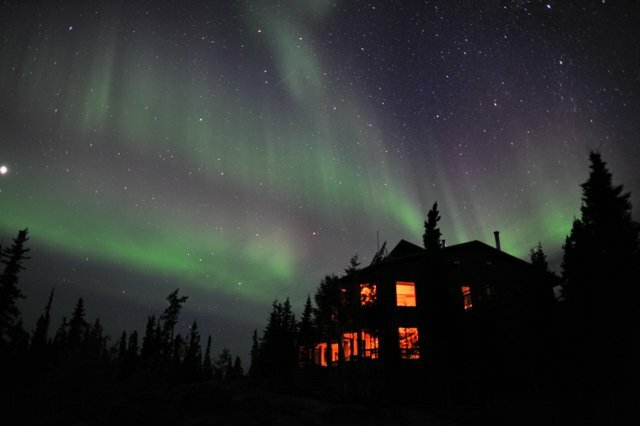 It’s commanding position gives guests opitimum viewing over the lake and to the night skies for views of the spectacular aurora. 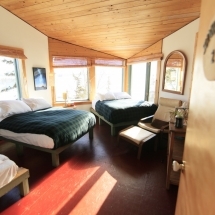 There are five large guest rooms on the second floor of the main lodge, with access to shared shower and washrooms. Lodge rooms are dressed with down duvets, and feature huge windows with expansive views. There are two viewing decks on the upper floors. The ground floor serves as the lounge, with bar, dining room and library. The ground floor includes the kitchen and a small office, and his and hers showers and washrooms, shared with cabin guests. 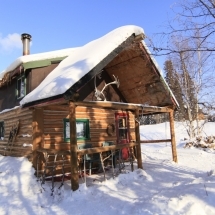 There are five log guest cabins to choose from - separated for privacy. Each has its own lake view, outside camp fire pit and outdoor toilet close by. They are heated by woodstoves, and feature propane lights plus a minimum of four beds with down duvets. Showers and bathrooms are a five minute walk to the lodge. Today you are at leisure to relax or join an optional guided excursion. Snow shoes, ice-skates and skis are available for all guests to use free of charge during their stay, so the temptation is always there to explore the surrounding winter wilderness. In traditional Canadian style, guests are known to break into an impromptu game of ice-hockey or curling on the lake. 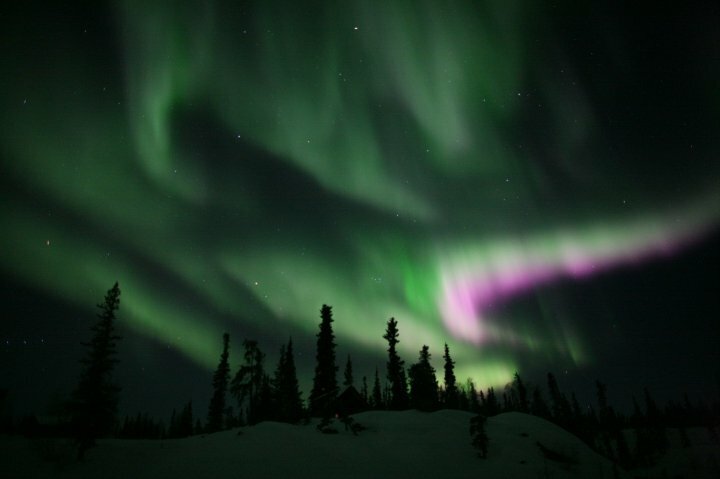 Each evening, if the weather obliges you’ll have an opportunity to marvel at the northern lights. 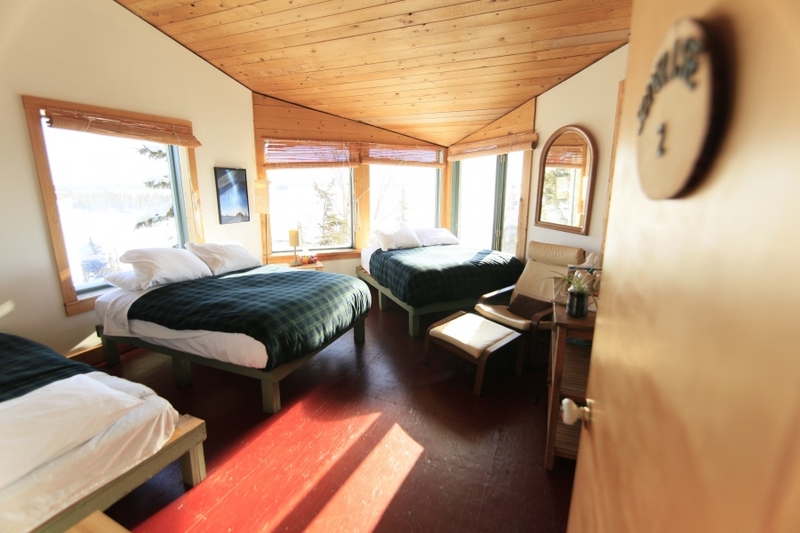 Choose your viewing spot from one of the viewing decks, the hot tub or the Aurora viewing windows in the main lodge. 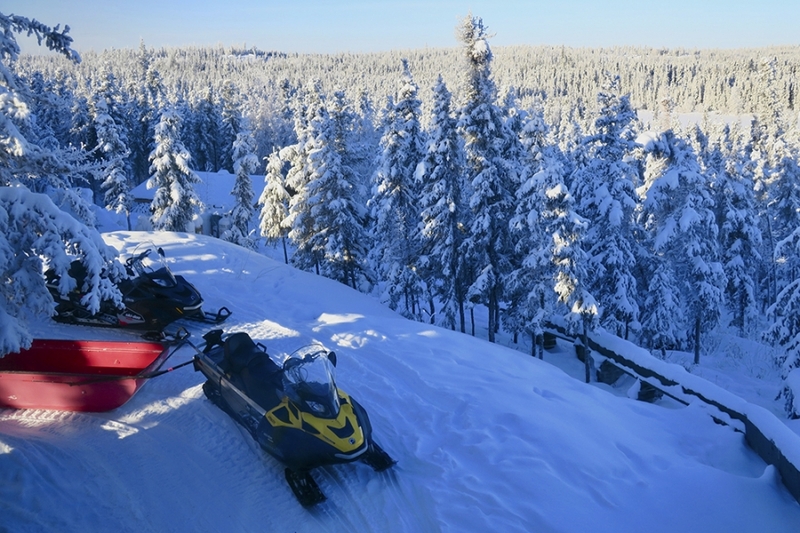 Today we recommend joining one of the lodge's signature snow mobiling tours to explore the surrounding wilderness. This easy route follows a series of three small lakes and bush trails joining Blachford and Long Lakes, and back to the lodge. Included in this trip is experiencing the now abandoned Cadieux family cabin on the Francois river system. 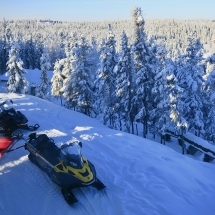 Choose to travel by snow mobile for the ice-fishing trip as above. A pleasant winding trail heads from the lodge at Blachford to Thor Lake, a rare mineral exploration camp. 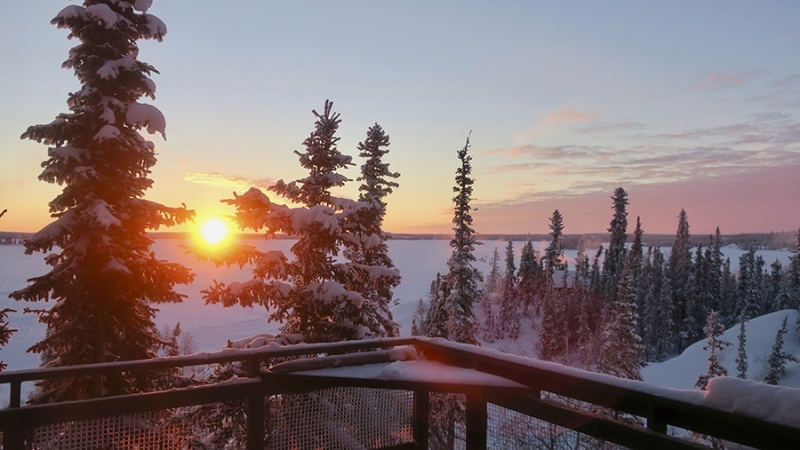 From there you head south on bush trails and join an old mine access road to overlook the East Arm of mighty Great Slave Lake and Blanchet Island. Then wind down a trail to the lake itself, to see close-up how the constant pressure of wind, currents and moon can create cracks on the surface and throw up blocks and ridges of ice. 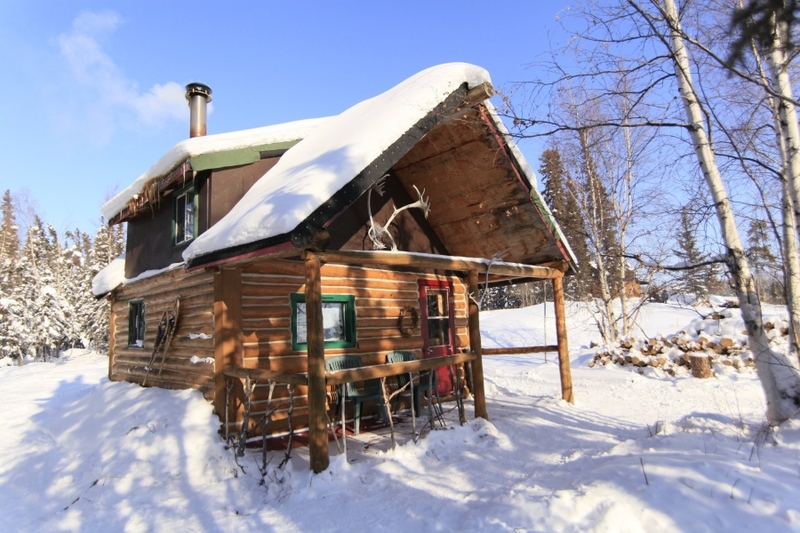 Travel the network of lakes around Blachford and visit what's left of the 1950s homestead of Henry and Mary Cadieux at Francois River. See open water rapids before crossing beaver ponds and travelling across more lakes and portages to visit a waterfall on the Beaulieu River. Head to an abandoned log cabin where many travellers’ names are inscribed on the walls and enjoy lunch around a camp fire. Covering almost 100km, this is the ultimate trip to view the majesty of North America’s deepest lake. Follow a series of winding trails to an old geologist’s cabin and the remains of the ‘Rex Cafe’, a mining camp dating back to the 1930s. Then it’s down onto the lake’s East Arm to see the incredible ice pressure ridges. Search the shorelines for prehistoric rocks then head back to the mainland and snuggle into the ‘Hole in the Wall’. This inlet provides shelter from the frequent high winds of the East Arm. Warm by a roaring campfire with a hot lunch before making your way back to the lodge. 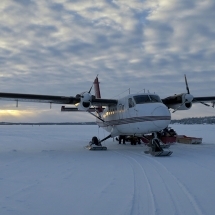 Departure via ski-plane to Yellowknife. 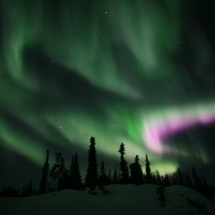 If you're not ready to leave, we can add extra nights and excursions to extend your Northern Lights holiday in Canada. We could not imagine a better place to view the Northern Lights. The Lodge sits within a pristine wilderness, far away from city lights. One needn't wander far from the entrance to the Lodge to see the lights. In fact, we experienced some dazzling views in the middle of the night through the window of our bedroom. The weather cooperated and we enjoyed impressive displays three nights out of four. 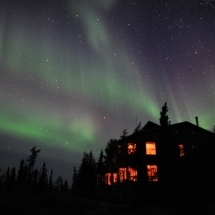 The ideal location of the Lodge is further attested by the 19 visits of Hiroaki Shintaku, a talented photographer who specializes in photographing the Aurora. While the challenge of photographing the lights in frigid weather is daunting, we felt privileged to share our time at the Lodge with Mr. Shintaku and grateful for his willingness to share his images. The Lodge is run primarily by a multicultural group of young volunteers from all over the world. They contribute an energy and joie de vivre that adds significantly to the experience. Their patience was also very helpful as we engaged as neophytes with the various winter activities offered. by Rick Moskovitz, Ocala, FL on Mar 01 .